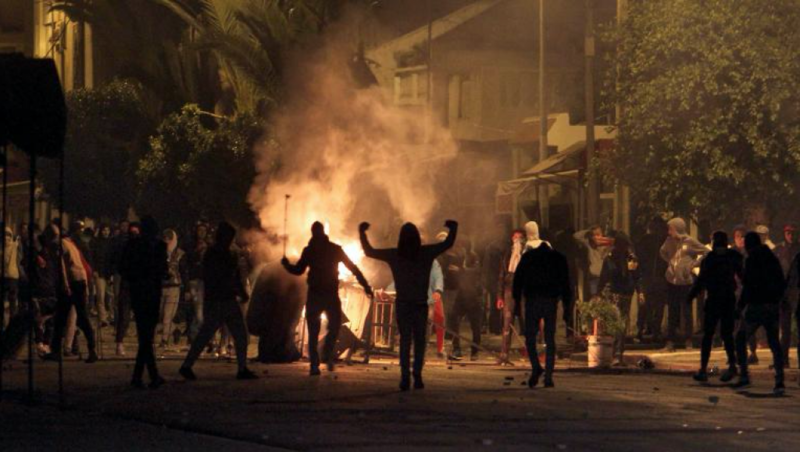 In the first days of January 2018, Tunisia has been shaken by a new round of social rebellion for socioeconomic rights, including demonstrations, roadblocks, and clashes with the police in most regions of the country. I will first summarise the facts and then provide a theoretical interpretation. The proximate cause of the unrest is the 2018 budget law, which enforced severe price hikes on many consumption goods. The deeper causes are, however, the same that originated the 2011 Tunisian Uprising, especially employment precarity and the lack of development in the marginalised regions1. If the Uprising has conquered an unprecedented level of civil and political rights, the Tunisian governments have contracted a series of loans with the IMF and World Bank that kept the country firmly within neoliberalism and its realities of rising inequality, austerity, and privatisations. Indeed, the price hikes of the 2018 budget law were part of the conditions set by the IMF for the release of the next tranche of credit to Tunisia. Political instability exacerbated the economic downturn. Real wages have stagnated, unemployment has augmented, the fall of the Tunisian dinar has aggravated inflation. Protests for social rights have never really ceased since 2011, with the highest peak before this one taking place in January 2016. In the spring and summer of 2017, the long blockades of the oil and gas extractive sites run by multinational companies in the southernmost regions of the country, Tataouine and Kebili, constituted remarkable struggles for employment, local development, and access to resources. Since late 2017, a new crescendo set in. On 18 October 2017, the village of Bir El Hafey (governorate of Sidi Bouzid) held a general strike to protest against the death of over forty Tunisian migrants, some originating from there, whose boat had been sunk in unclear circumstances by the Tunisian navy. On 17 November 2017, in Sejnane, Radhia Merchegui committed suicide by setting herself on fire to protest against the suspension of poverty aid to her family. This is a tragically common pattern. Her death triggered a series of mass mobilisations in the small town, including two general strikes and clashes against the police. On 6 January 2018, another protest suicide was committed, in the village of Sakiet Sidi Youssef at the border with Algeria, by a 29-year old protesting against marginalisation. Other youths thus blockaded the road leading to Algeria. After this episode, social protests quickly surfaced all over the country. Most mobilisations featured demonstrations during the day and clashes with the police during the night. Several institutional buildings were destroyed and looting also occurred, especially in the suburbs of Tunis. The first clashes took place between 7 and 8 January in the small town of Tala (governorate of Kasserine). They then continued for three nights in several cities. On 8 January, the 43-year old man Khomsi El-Yeferni died in Tebourba (governorate of Manouba) during clashes with the police. According to the authorities, the man suffered from previous respiratory problems and died by inhaling tear gas. However, the El-Yeferni family contradicted this account. By the night of 11 January, the situation came to a relative calm but clashes picked up again in the night between 14 and 15 January. The Ministry of Interior declared to have arrested a total of about eight hundred protesters, a very high number that has drawn the concerns of institutions like Amnesty International and the UN Human Rights spokesman. Following a consolidated pattern, most protests seemed to happen through informal modes of organisation, non-ideological frames, and local solidarities. At times, the local branches of the main trade union UGTT call for solidarity general strikes, but the top of the confederation is now incorporated in the “Carthage Pact” that backs, despite all the tensions, the incumbent grand coalition government. A nationwide organised campaign has however been taking place under the name of Fesh Nestanew (What Are We Waiting For). The campaign militates against neoliberal austerity, against the subordination of Tunisian society to neo-colonial diktats, and for the expansion of social rights. The campaign was mainly started by the Popular Front, a coalition of Marxist-Leninist and Arab nationalist parties. However, several figures of the Tunisian left who are not linked to the Popular Front also adhered. The campaign organised a series of local actions that culminated with two days of national demonstrations on 12 and 14 January 2018 (the latter is the anniversary of Ben Ali’s downfall). Several activists of the campaign have been arrested over the last days. 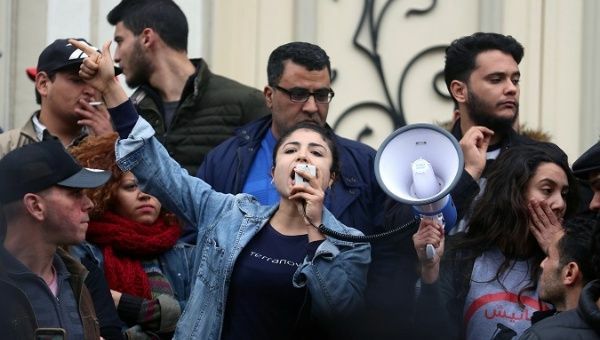 The main actors – youths without access to regular income -, demands – secure employment and local development – and forms of contentious action – the roadblock and the riot – are still the same that have fuelled class struggle in Tunisia since 2008. One of the deep causes of this cycle of struggles is the interruption of the trend towards the expansion of access to stable income for broadening segments of the workforce that had characterised the developmental path of Tunisia between the late 1950s and the late 1970s. This phenomenon is often referred to, for Tunisia as well as for other countries in the global South, as the rupture of the populist social pact. But the neoliberal weakening of the populist trend towards increasing job security has not stopped other potentially empowering trends, like the rise in average levels of education, health, and income (although during the neoliberal phase this rise has been much slower than in the populist one). The analysis of broad employment trends can be illuminating (2). In Tunisia, the share of agricultural employment saw a secular decline. However, until the 1970s, the losses in agricultural employment were compensated by the growth of manufacturing and of the public administration. But, with neoliberal restructuring, the share of employment in both of these outlets has ceased growing. Employment in manufacturing not only stagnated quantitatively, it also changed qualitatively. Relatively secure employment in the SOEs declined while more precarious employment in light industry for export augmented. Tunisia too has it Rustbelts and Sunbelts. The sector in which the share of employment augmented secularly is the private tertiary sector. But for the large majority of Tunisian workers, the private tertiary sector does not mean creative work in the culture industry or a highly paid job in finance. It means precarious toil in the low-end services, often unwaged and/or in the informal sector. Tunisia’s employment trends are coherent with the global tendencies underlined by Aaron Benanav and Endnotes’ interpretation of Marx’s “general law of capitalist accumulation”(3). Marx held that there is a tendency for the organic composition of capital to rise, i.e. a drive for dead labour (machines and stored knowledge) to increase relative to living labour (workers’ socially necessary labour time). Capital is in fact compelled by horizontal and vertical conflict (respectively intra-class competition and inter-class struggle) to seek relative surplus rather than absolute surplus, that is surplus stemming from productivity gains rather than from an increase in the rate of exploitation. Capitalists must introduce new machinery over time in order to survive market competition and keep workers’ offensives in check. Technological innovations then spread within and across sectors, restoring competition, expelling workers, bringing down prices and profits, and prompting capital to seek new product lines. Of course, this “law” is not as law-like as it is presented in objectivist Marxist accounts. It can be offset by a wide array of contingent counter-tendencies. But it is a pressure constantly operating in the capitalist mode of production, whose effects become evident in the absence of powerful enough counter-tendencies (e.g. massive destructions of dead labour). One of the effects of automation has been the secular decline in agricultural employment, as peasants and agricultural labourers were expelled from the land by mechanic seeders and pickers. Historically, the fall of agricultural employment was partially compensated by the rise of industry. But the latter is also amenable to high levels of automation and, in fact, in recent decades the global share of industrial workers does not seem to have augmented. The tertiary sector, therefore, bears the employment burden of workers evacuated from agriculture and industry. But many services do not yield the rapid productivity gains that would be needed to guarantee high growth rates and the full recuperation of job losses. The lack of employment alternatives is particularly severe in the Maghreb. In Tunisia, the famous case of Mohamed Bouazizi, the trigger of the 2011 Uprising, is extremely emblematic of these global tendencies. The young man, in fact, was an agricultural labourer who had lost his job after the sale of the land where he used to work and the restructuring of production there. Automation increases the productivity of those workers who remain in core production and, by doing so, it augments the proportion of workers relatively less necessary to it. This is the surplus population, living the condition of precarious employment and irregular access to income. Under states that do not provide unemployment subsidies sufficient for a decent living, the members of the surplus population usually still need to work to survive. In these contexts, “unemployment” can be seen as a cultural construct indicating that a person works below the conditions that are considered acceptable according to the prevailing social norms, which are in turn outcomes of previous struggles. The label “unemployed” is thus misleading here, since it is frequently applied to people actually performing waged or unwaged precarious work with varying frequency. This is why I adopt the category of “precarious workers” to design most members of the Tunisian surplus population. The precarious are part of the working-class because they are compelled to sell – directly or indirectly – their labour power to capital, even if their labour power does not find a stable buyer. Class is best defined by dispossession, not by exploitation. I also consider the “dependent self-employed” to be part of the class. In fact, they can be seen like Marx saw smallholding peasants in his time: “The smallholding of the peasant is only a means for capitalists to draw profit, interest, and rent from the soil, leaving to the farmer himself how to extract his wages”(4). Changes in the technical composition of the Tunisian working class have been taking place along with transformations in its forms of consciousness and struggle. Precarious workers engender latent or active pressures on the relatively secure ones, eroding their bargaining power and thus blurring the sociological frontier between precarious and secure workforce. Precarity spreads across sectors and subjects, undermining or weakening the forms of consciousness and organisation that characterised the period of expanding shares of industrial employment. Tunisian workers participated in the “long 1968” global cycle of struggles, especially since the strike wave that began in 1971. In Tunisia, this cycle of struggles can be said to have ended in 1985 with the state crackdown on the main trade union Union Générale Tunisienne du Travail (UGTT), that had temporarily abandoned its corporatist policy. The protagonists of this cycle were a new generation of educated workers and young elements of the middle classes that radicalised leftwards before entering the workforce and the UGTT. The precarious workers also mobilised, especially during the unrest that coincided with the UGTT national general strike of 26 January 1978 and with the Bread Riots of January 1984. On both occasions, the army repressed the protests causing numerous casualties. But the strongholds of Tunisian labour militancy were the industrial and transport SOEs created as part of the country’s former import-substitution industrialisation policy. The strike was the central form of struggle and the core of the demands revolved around the wage. Indeed, real wages rose rapidly in the mid-1970s. Most strikes took place without the authorisation of the UGTT, although they were often supported by the union left. Broadly left-wing ideas and sensibilities prevailed at the time, especially in the guise of Arab nationalism and Marxism-Leninism. The regime initially responded with abundant socioeconomic concessions, but rising debt and the need for hard currency eventually pushed it to take the path of a characteristic structural adjustment program – that officially started in 1986 – under the directives of the international financial institutions. Following the familiar script, the previous strongholds of labour militancy were restructured, privatised, or relinquished to slow deterioration. Although many SOEs survived, they necessitated less employees either because of the introduction of new machinery or because the lack of it, combined with free trade agreements, rendered them less competitive and limited their market shares. The workplace unions in many SOEs abandoned their former militancy and were incorporated in a capillary system of clientelism, especially in hiring. In fact, in Tunisia, public sector employment is seen as the way to income and existential security, but in a time of spluttering investment and fiscal crisis of the state this is a very overcrowded node of the labour market. A telling example of the decline of labour militancy in the SOEs is the public mining company Compagnie des Phosphates de Gafsa (CPG). Since the time of the French protectorate, the Gafsa miners had a reputation for their combativeness and their thousands-strong strikes. But with the technological and organisational restructuring of the CPG, the number of its employees shrunk from over thirteen thousand in 1985 to less than half that figure in 2006. In the January 2008 Gafsa Revolt for employment, the protesters charged that recruitment in the CPG was rigged by nepotism and political clientelism in which UGTT officials were themselves implicated. The long-time Gafsa regional UGTT SG Amara Abbassi – coming from the Mining Federation – was also an MP with the ruling party and the owner of companies that provided outsourced labour to the CPG. Most workers who had managed to enter the CPG were unlikely to jeopardise their luck by mobilising in solidarity with the precarious fractions. They remained passive in the workplace during the events of 2008 and their union representatives mostly took a hostile attitude towards the protests. The UGTT militants who supported and even led the movement were all from the public administration. The protagonists of the latest major cycle of struggles, which can be said to have begun with the 2008 Gafsa Revolt and to last into the present days, were not relatively secure waged workers. Public administration employees and manufacturing workers were crucial in participating in the regional general strikes called by the UGTT at the peak of the 2011 Uprising, and they were the backbone of a massive surge of strikes in the wake of Ben Ali’s fall. But the regional general strikes were brought into existence by the pressure coming not from the factory shop floor, but from the streets outside. Since the Gafsa Revolt, the most noticeable social actors on the streets have been the precarious youths. “Youth” can be understood as a culturally constructed designation to indicate a person “in transition” between childhood and adulthood. A consequence of precarity (as well as of longer time in education) is the lengthening this transitional phase. While the protesting precarious youths have often been supported by the UGTT left, their very employment situation makes it unfeasible for them to join labour unions and to use the strike as their privileged form of contentious action. Most do not mobilise within the framework of any formal and stable organisation. The contemporary Tunisian left faces competition from a strong Islamist movement, and both meet a socially diffuse “anti-politics” sentiment. The Union des Diplômés Chômeurs (UDC) provides a durable leftist organisational and ideological presence among the precarious youth, but this unemployed union mostly represents unemployed graduates, who are only a fraction of the precarious. 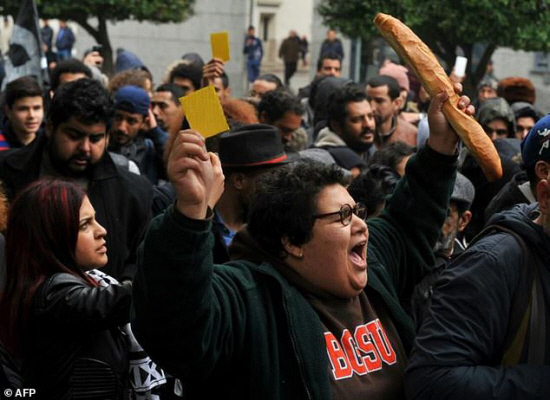 The roadblock and the riot can be said to be the core forms of struggle of the Tunisian precarious. The roadblock is less sensational than the riot, but it can produce greater economic damage with the convenience of being more sustainable in time and of involving less dangers of human harm to the participants and to others. Breaking off the production of value from without the workplace, the roadblock becomes the strike of the workless. The protesters make use of logistical weak spots to hamper the circulation of strategic commodities (e.g. phosphates, oil, gas) and thus slow down or stop their production. However, different from the strike, the roadblock is illegal and therefore its practicability depends directly on the balance of power between protesters and law enforcement. Another widespread characteristic of these struggles is the importance of communal solidarities, as indicated by the localised village- and neighbourhood-based forms of organisation at the peaks of mobilisations. Autonomist feminism is essential to understanding the community as a site of class struggle, thanks to its insights on the realm of social reproduction as integrated in the circuits of capital accumulation5. As Silvia Federici writes, communal struggles can “shape a collective identity, constitute a counterpower in the home and the community, and open a process of self-valorization and self-determination”(6). Strong communal bonds can compensate for the absence of occupational cohesion and for the weakness of formal organisations of the precarious. Communal solidarity is compatible with class solidarity and can potentially reinforce it. Indeed, in 2010–11, and to a lesser extent in January 2016 and 2018, local struggles circulated across the country through a discourse of social justice and defiance of the political and economic elites. Communal solidarity, however, is not an unproblematic vehicle of class recomposition. It can swing in disparate directions depending on a host of contextual factors, and therefore it is fragile and politically ambivalent. The question of what organisational forms could put down roots in local communities is a matter on which the Tunisian political militants have been reflecting and experimenting over the years. To be sure, the struggles of the last years have demonstrated a great resilience. Phosphate train blocks in the mining basin of Gafsa, burning tires in agricultural Sidi Bouzid, sit ins at the governorate of the border town Kasserine, fires of dumpsters in the banlieues of Tunis, oasis occupations in Kebili, blockades of extractive multinationals in the desert of Tataouine… The (hi)story that found a new beginning in 2008 has been bitter, but the future is unwritten. 1 Demands for secure employment and economic development clarify the social nature of these grievances and protests but they are also, of course, politically ambiguous. However, they should not be completely taken at face value, in the sense that what the protesters want is obviously the stable income stemming from secure employment and the access to welfare services and resources stemming from development. The ambiguity, thus, lies in the fact that both job security and local development are very vague signifiers that can be articulated in manifold, contradictory, and more or less progressive ways. 2 For a more complete discussion, see Lorenzo Feltrin, 2017, “The Struggles of Precarious Youth in Tunisia: The Case of the Kerkennah Movement”, Review of African Political Economy, DOI: 10.1080/03056244.2017.1416460. For other references on the Tunisian precarious, see Aymen Belhadj and Damiano De Facci, “L’État dans l’impasse: La crise de l’emploi dans les régions de l’intérieure en Tunisie postrévolutionnaire”; Hamza Meddeb, 2011, “L’ambivalence de la course à ‘el khobza’ : Obéir et se révolter en Tunisie”, Politique africaine, 121, pp. 35-51; Samira Hamdi and Irene Weipert-Fenner, 2017, “Mobilization of the Marginalized: Unemployed Activism in Tunisia”, Working Paper 43, Issam Fares Institute for Public Policy and International Affairs; Stefano Pontiggia, 2017, Il bacino maledetto: Disuguaglianza, marginalità e potere nella Tunisia postrivoluzionaria, Verona: Ombre Corte. 3 See Aaron S. Benanav, 2015, A Global History of Unemployment: Surplus Populations in the World Economy, 1949-2010, PhD Thesis (University of California, Los Angeles); Aaron S. Benanav, 2015, “Precarity Rising”, Viewpoint Magazine, https://www.viewpointmag.com/2015/06/15/precarity-rising/; Endnotes, 2010, “Misery and Debt”, in Endnotes 2: Misery and The Value Form, https://endnotes.org.uk/issues/2/en/endnotes-misery-and-debt; Endnotes, 2015, “An Identical Abject-Subject?”, in Endnotes 4: Unity in Separation, https://endnotes.org.uk/issues/4/en/endnotes-an-identical-abject-subject. 4 Karl Marx, 1996 (1852), “The Eighteenth Brumaire of Louis Bonaparte”, in Marx: Later Political Writings, edited by Terrell Carver, p. 120, Cambridge: Cambridge University Press. 5 See Silvia Federici, 2008, “Precarious Labour: A Feminist Viewpoint”, https://inthemiddleofthewhirlwind.wordpress.com/precarious-labor-a-feminist-viewpoint/. The autonomist understanding of social reproduction has recently been adopted also by other theoretical currents, see Tithi Bhattacharya, 2017, Social Reproduction Theory: Remapping Class, Recentering Oppression, London: Pluto Books and Viewpoint Magazine, 2015, Issue 5: Social Reproduction, https://www.viewpointmag.com/2015/11/02/issue-5-social-reproduction/. Within the latter, the essay “Surplus Population, Social Reproduction, and the Problem of Class Formation” by Bue Rübner Hansen is particularly relevant for the questions treated here. 6 Silvia Federici, 2010, “Feminism and the Politics of the Common in an Era of Primitive Accumulation”, in Uses of a Whirlwind edited by Team Colors Collective, Oakland (CA): AK Press.